Reader Question: What are the best ETFs to invest in the U.S. Dividend Aristocrats? A reader asked this follow-up question in reference to the recent Hank Coleman post, What is a Dividend Aristocrat? The closest ETF to investing in the U.S. dividend aristocrats is the SDPR S&P Dividend ETF (ticker SDY). This ETF tracks the S&P High Yield Dividend Aristocrats Index (not to be confused with the Dividend Aristocrats Index). As a refresher, this index holds roughly 60 of the highest dividend yielding companies in the S&P 1500 Index. The qualifying factor to be in included in this index is that the company has to have a history of increasing their dividend per share for at least 25 years. That means that the majority of the stocks that make up the index will be high quality large capitalization companies with plenty of sustainable free cash flows available to pay out to their shareholders. Companies that are able to do this on a consistent basis are a dividend investor’s dream. 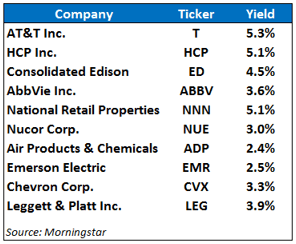 The dividend yield for the most of the top ten holdings are actually much higher than the overall yield for SDY, which is around 2.5%. SDY also offers investors a fairly inexpensive way to gain a broad diversification to the dividend aristocrat stocks with an expense ratio of only 0.35%. 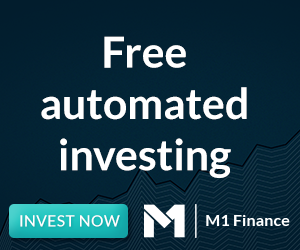 This is a great deal for those investors that don’t have the know-how, time or the portfolio size to buy individual dividend stocks on their own. SDY is heavily weighted in consumer staples, financials and industrials. These three sectors make up almost half of the index and ETF. The performance numbers for SDY have been solid over a number of different time frames. Year-to-date through September 26th, SDY is slightly outpacing the S&P 500’s return of roughly 20% with a return of almost 21% for 2013. This ETF lost almost 5% in the downturn in August but has made most of that back in the September rally. The three and five-year performance numbers are even more impressive. The annualized three-year returns for SDY of about 22%, dwarfs the S&P 500 returns of just under 17% per year. Over five years, SDY has returned 9.5% per year while the S&P 500 has earned 9.3%. The high quality stocks that make up this portfolio have the added benefit of performing well in a down market. During the financial crisis of 2008 when the S&P 500 was down -37%, SDY only lost -23%. Dividend stocks are not immune to large losses, but high quality businesses with recurring cash flows tend to hold up better during times of distress than stocks that rely heavily on borrowed money or rapid earnings growth to attract investors. If you are looking to go bargain hunting in any of the top ten names that make up SDY, National Retail Properties (ticker NNN) is down over 20% from the all-time high price that was reached in May. National Retail Properties is a real estate investment trust (REIT) that got hammered during the July and August rise in interest rates. It’s impossible to predict whether or not buying this stock is a case of trying to catch a falling knife or not, but a yield of over 5% can help cushion the blow if further losses are ahead. Avrom has actually covered the Canadian version of this ETF (ticker CUD-T) that trades on the TSX (see Claymore’s New Dividend ETF – CUD). This ETF is now owned by iShares, and is called the S&P US Dividend Growers Fund. He goes into more detail on how the ETF is structured along with some thoughts on the role of currency hedging for Canadian investors. He also covers the important issue of yield-weighting in both CUD and SDY. Readers, what are your thoughts? Interested in SDY for your portfolio? If you enjoy reading the Dividend Ninja, don’t forget to also subscribe to the Dividend Ninja Newsletter. You can also get just the blog posts. Thanks for reading! I think for those with less capital to invest, or who are not comfortable buying stocks directly, SDY is a pretty good deal! I agree. SDY could be a little more stable than some of the individual names as well. But if you can choose 10-20 individual names, that’s pretty good diversification as long as they are spread out in different sectors. How does VIG compare with SDY? Good question. VIG tracks the NASDAQ US Dividend Achievers Index which includes companies that have increased their dividends for 10 consecutive years. There are almost 150 stocks in the index compared to 60 for SDY. It contains less financial stocks but more telecom names than SDY. The yield is currently about 2.14% so it’s less than SDY and not much higher than the yield on the S&P 500 (about 2%). Similar 3 and 5 years returns as SDY but lagging a bit this year. Top 10 names are more recognizable: PEP, MCD, WMT, XOM, IBM, KO to name a few. Thanks for this article. 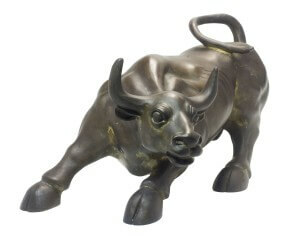 I am researching and about to begin my 20 stock dividend portfolio based off of the Dividend Aristocrats. Which 20 or so Dividend Aristocrats would you consider as the best ones and what criteria would you use to choose them?